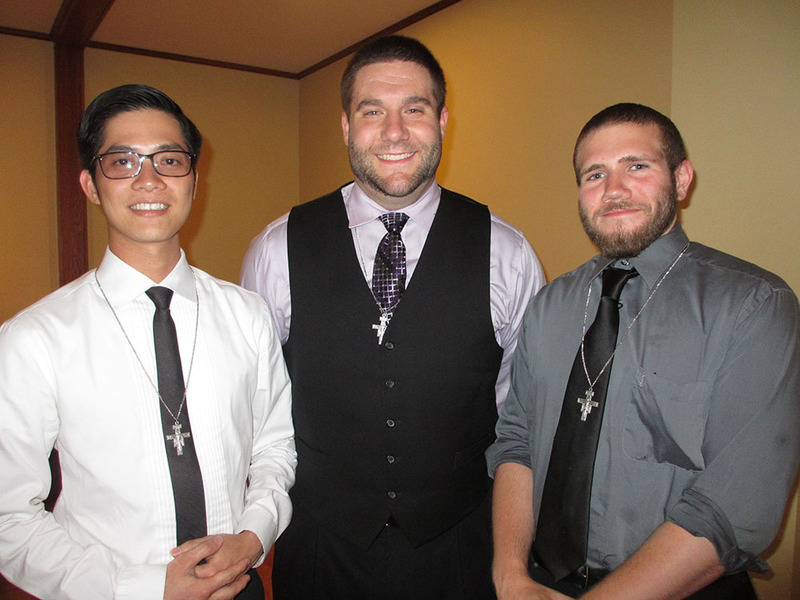 On July 22, 2015 at the National Shrine of St. Maximilian Kolbe at Marytown, (L-R) ) Mr. Ky Bui, Mr. Jonathan Byrum, and Mr. Jason DiMartini began their postulancy with the Our Lady of the Angels Province. 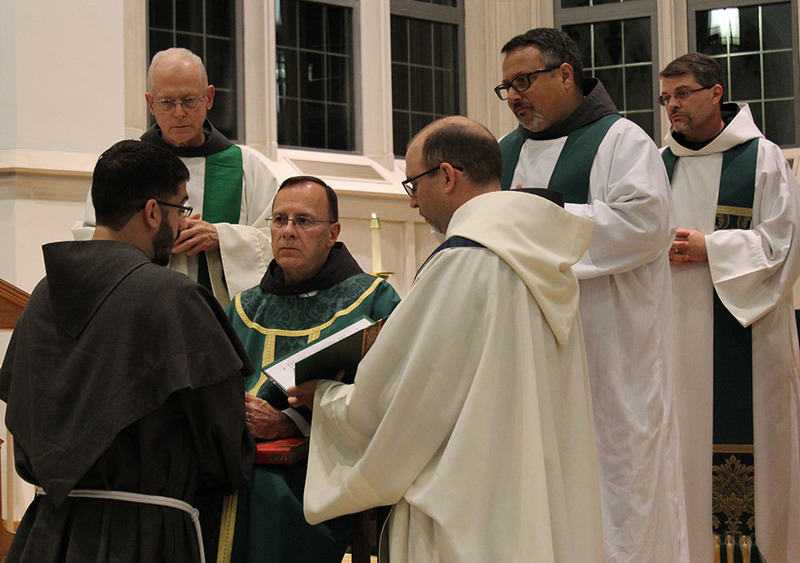 45 friars from around the country gathered to welcome the young men into “Beginning Fraternity” with the Franciscan Friars Conventual. friar Timothy Blanchard, OFM Conv. and friar Franck Sokpolie, OFM Conv. flank Minister Provincial, the Very Reverend Fr. James McCurry, OFM Conv. who Invested these new Our Lady of the Angels Province Novices into the habit of Franciscan Friars Conventual (OFM Conv.) in July 2015. They will now proceed to a year of study and prayer at the North American Novitiate, in Mishawaka, IN. Note that they do not have knots in their cords. 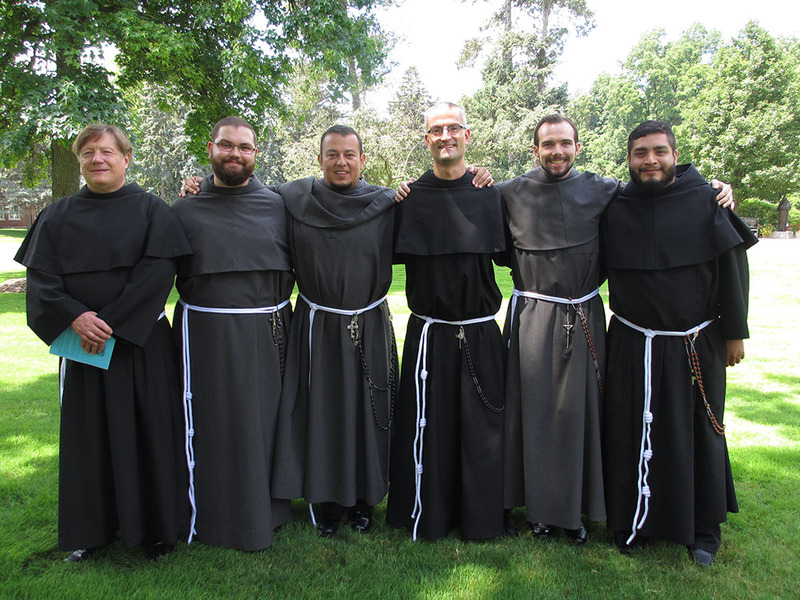 Our Lady of the Angels Province friar Jose Maria (Jorge) Lindo (third from left) with his confreres of the Simple Profession Class of 2015. Note they all have knotted cords now that they have completed their Novitiate year, Professed their Simple Vows of Poverty, Chastity and Obedience and are moving onto the Post-Novitiate stage of Formation! During Mass on July 12th, friar Emanuel Vasconcelos, OFM Conv. (kneeling left) renewed his Simple Vows in front of a congregation of over 100 people, in Duke Divinity School’s Goodson Chapel. Fr. 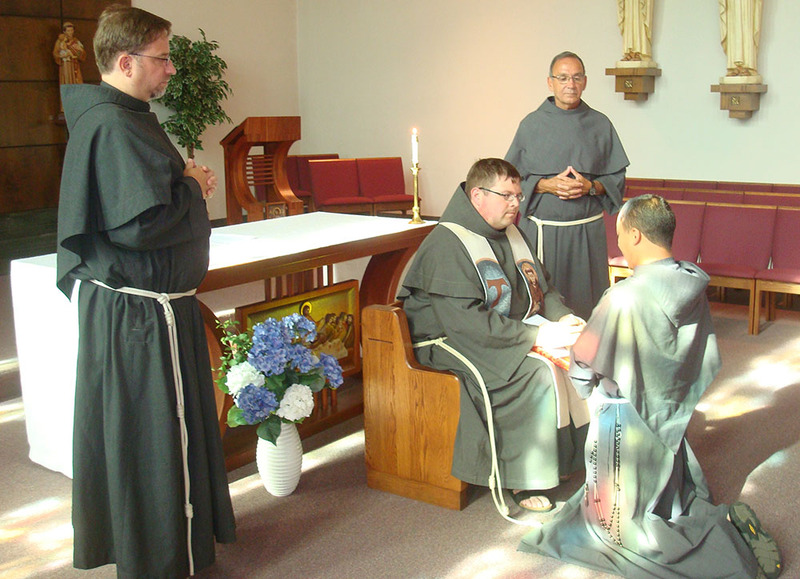 Brad Heckathorne, OFM Conv., (seated) St. Anthony Padua Friary Guardian (Duham, NC) received friar Manny’s vows as the Minister Provincial’s delegate, witnessed by Fr. Andy Santamauro, OFM Conv. (standing right) and Fr. Bill Robinson, OFM Conv. (standing left). Fr. Michael Lasky, OFM Conv. (kneeling right) served as emcee and Fr. Justin Ross, OFM Conv. (standing far right) concelebrated Mass. 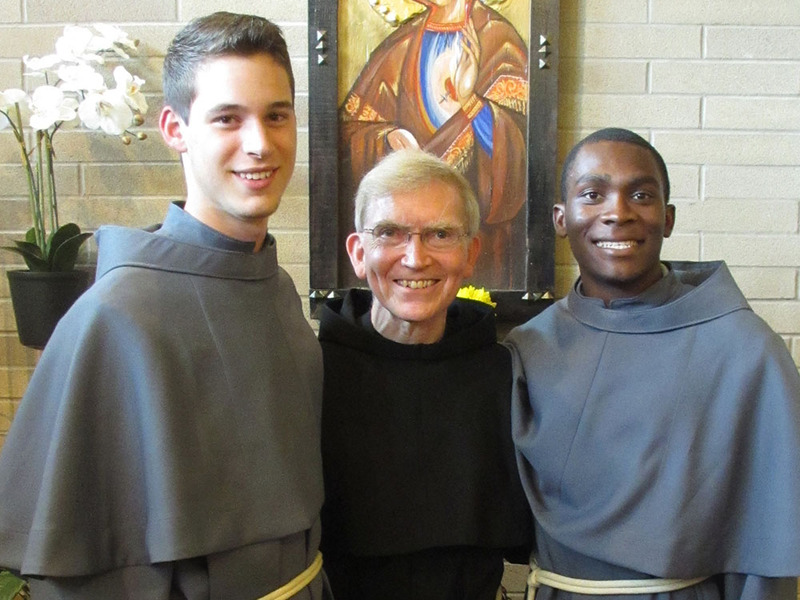 On July 19, 2015, in the Chapel of Archbishop Curley High School, friar Maximilian Avila, OFM Conv. (kneeling) renewed his Simple Vows during Evening Prayer. Friary Guardian, Fr. Matthew Foley, OFM Conv. (seated), accepted his vows on behalf of our Minister Provincial. The vow renewal was witnessed by Br. Jim Moore, OFM Conv. (standing right) and Fr. Gary Johnson, OFM Conv. (standing left). Friar Chris Dudek, OFM Conv. 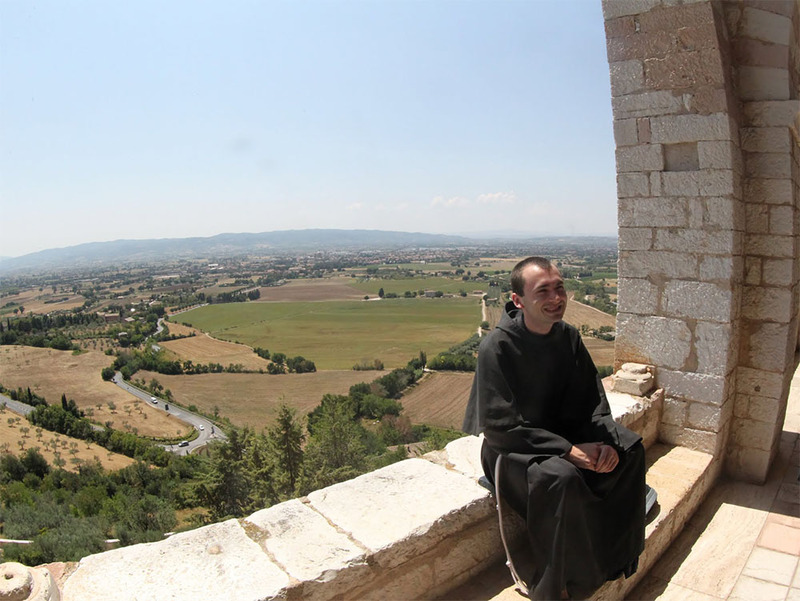 enjoys the view from the Porticato of the Sacro Convento. Friar Chris is an Our Lady of the Angels Province friar who professed his Solemn Vows on August 2, 2015, the Feast Day of our Province.